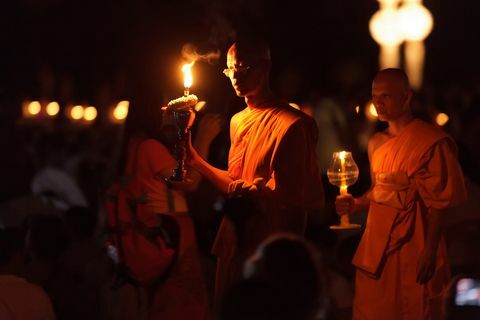 Buddhist monks' procession in the Loy Krathong and Yi Peng Festival on November 24, 2012, in Chiangmai, Thailand. Any history of Buddhism must begin with the life of the historical Buddha, who lived and taught in Nepal and India 25 centuries ago. This article is the next part of the history -- what happened to Buddhism after the Buddha's death, about 483 BCE. This next chapter of Buddhist history begins with the Buddha's disciples. The Buddha had many lay followers, but most of his disciples were ordained monks and nuns. These monks and nuns did not live in monasteries. Instead, they were homeless, wandering through forests and villages, begging for food, sleeping under the trees. The only possessions monks were allowed to keep were three robes, one alms bowl, one razor, one needle, and one water strainer. The robes had to be made from discarded cloth. It was a common practice to use spices such as turmeric and saffron to dye the cloth to make it more presentable -- and possibly smell better. To this day, Buddhist monks' robes are called "saffron robes" and are often (although not always) orange, the color of saffron. When the Buddha died, the monk who became a leader of the sangha was named Mahakashyapa. The early Pali texts tell us that, shortly after the Buddha's death, Mahakashyapa called a meeting of 500 monks to discuss what to do next. This meeting came to be called the First Buddhist Council. The questions at hand were: How would the Buddha's teachings be preserved? And by what rules would the monks live? Monks recited and reviewed the Buddha's sermons and his rules for monks and nuns, and agreed which were authentic. According to historian Karen Armstrong (Buddha, 2001), about 50 years after the Buddha's death, monks in the eastern part of North India began to collect and order the texts in a more systematic way. The sermons and rules were not written down but had been preserved by memorizing and reciting them. The Buddha's words were set in verse, and in lists, to make them easier to memorize. Then the texts were grouped into sections, and monks were assigned what part of the canon they would memorize for the future. By about a century after the Buddha's death, sectarian divisions were forming in the sangha. Some early texts refer to "eighteen schools," which did not appear to be markedly different from one another. Monks of different schools often lived and studied together. Sthaviravada: "Sthaviravada" is Sanskrit for "the Way of the Elders." The Sthaviavada school was conservative, adhering closely to the teachings and rules of the Pali Canon. The school lives today in parts of Asia by its Pali name, Theravada. Mahasanghika: This school probably is a forerunner of Mahayana Buddhism. Mahasanghika developed the idea of the transcendent nature of a Buddha, the ideal of the bodhisattva, and the doctrine of shunyata, or "emptiness." This school advocated a somewhat more liberal approach to the monastic rules. A Second Buddhist Council was called about 386 BCE in an attempt to unify the sangha, but sectarian fissures continued to form. Ashoka (ca. 304–232 BCE; sometimes spelled Asoka) was a warrior-prince of India known for his ruthlessness. According to legend, he was first exposed to Buddhist teaching when some monks cared for him after he was wounded in battle. One of his wives, Devi, was a Buddhist. However, he was still a cruel and brutal conqueror until the day he walked into a city he had just conquered and saw the devastation. "What have I done?" he cried and vowed to observe the Buddhist path for himself and for his kingdom. Ashoka came to be the ruler of most of the Indian subcontinent. He erected pillars throughout his empire inscribed with the Buddha's teachings. According to legend, he opened seven of the original eight stupas of the Buddha, further divided the Buddha's relics, and erected 84,000 stupas in which to enshrine them. He was a tireless supporter of the monastic sangha and supported missions to spread the teachings beyond India, in particular into present-day Pakistan, Afghanistan, and Sri Lanka. Ashoka's patronage made Buddhism one of the major religions of Asia. By the time of Ashoka's reign, the rift between Sthaviravada and Mahasanghika had grown large enough that the history of Buddhism splits into two very different versions of the Third Buddhist Council. The Mahasanghika version of the Third Council was called to determine the nature of an Arhat. An arhat (Sanskrit) or arahant (Pali) is a person who has realized enlightenment and may enter Nirvana. In the Sthaviravada school, an arhat is the ideal of Buddhist practice. A monk named Mahadeva proposed that an arhat is still subject to temptation, ignorance, and doubt, and still benefits from teaching and practice. These propositions were adopted by the Mahasanghika school but rejected by Sthaviravada. In the Sthaviravada version of history, the Third Buddhist Council was called by Emperor Ashoka about 244 BCE to stop the spread of heresies. After this Council completed its work the monk Mahinda, thought to be a son of Ashoka, took the body of doctrine agreed upon by the Council into Sri Lanka, where it flourished. The Theravada school that exists today grew from this Sri Lankan lineage. The Fourth Buddhist Council probably was a synod of the emerging Theravada school, although there are multiple versions of this history, also. According to some versions, it was at this council, held in Sri Lanka in the 1st century BCE, that the final version of the Pali Canon was put in writing for the first time. Other accounts say the Canon was written down a few years later. It was during the 1st century BCE that Mahayana Buddhism emerged as a distinctive school. Mahayana possibly was an offspring of Mahasanghika, but there probably were other influences also. The important point is that Mahayana views didn't happen for the first time in the 1st century, but had been evolving for a long time. During the 1st century BCE The name Mahayana, or "great vehicle," was established to distinguish this divergent school from Theravada/Sthaviravada school. Theravada was derided as "Hinayana," or the "lesser vehicle." The names point to the distinction between Theravada's emphasis on individual enlightenment and the Mahayana ideal of the enlightenment of all beings. The name "Hinayana" is generally considered to be a pejorative. Today, Theravada and Mahayana remain the two primary doctrinal divisions of Buddhism. Theravada for centuries has been the dominant form of Buddhism in Sri Lanka, Thailand, Cambodia, Burma (Myanmar) and Laos. Mahayana is dominant in China, Japan, Taiwan, Tibet, Nepal, Mongolia, Korea, India, and Vietnam. By the year 1 CE, Buddhism was a major religion in India and had been established in Sri Lanka. Buddhist communities also flourished as far west as present-day Pakistan and Afghanistan. Buddhism had divided into Mahayana and Theravada schools. By now some monastic sanghas were living in permanent communities or monasteries. The Pali Canon was preserved in written form. It is possible some of the Mahayana sutras were written or being written, at the beginning of the 1st millennium, although some historians put the composition of most of the Mahayana sutras in the 1st and 2nd centuries CE. About 1 CE, Buddhism began a vital new part of its history when Buddhist monks from India took the dharma to China. However, it would yet be many centuries before Buddhism reached Tibet, Korea, and Japan.